Besides doing damage to a yard, moles are just creepy looking. Isn’t it cool how Dora Mae gets to DO what her breed was bred for in so many years past? She’s fulfilling her purpose! I love the picture with the dirt on her nose. My mom used to have a red mini dachshund named Scarlett O’Hairy. When we spoke to her she grinned at us. I love ‘em. Scarlet O’Hairy! Joye, that cracks me up!!!! Too cute, Kathy! My Westie will kill bugs in my house if you say, “Angus! Get the bug!” My lab goes out to get the newspaper every morning and will fetch her “necklace” (collar). I guess they are fairly helpful around the house. How could anyone live without dogs? Scarley O’Hairy is a very funny name! We have named our dogs after old ladies in our family. Not just my two but my sister’s and brothers dogs as well are named after aunts in our family. hehe. Moles are very very creepy looking. When I saw the one in the neighbors yard, it looked like a tube. I couldn’t see the head. The front claws were icky. Ewww! And I don’t know what I’d do without my dogs. Especially Dora Mae who is my favorite. I’m allowed to have a favorite dog since I don’t have a favorite kid! I posted recently about my battle with moles also (“The Mole That Got My Goat”) I’m also in D/FW. 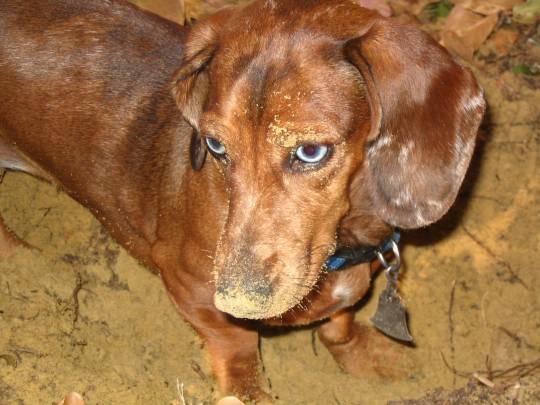 I was about to have my lawn treated for grubs, but after your post I think I’ll just get a weiner dog instead!